Big hair. 80's rock. And puppy love. If you're my age, you remember what it was like growing up in the glory of the 80's and now, you can relive those memories with the brand new Rock of Ages Broadway musical soundtrack. Rock of Ages, the Broadway musical, stars American Idol finalist Constantine Maroulis. Set in 1987 in a legendary Sunset Strip rock club, a small-town girl meets a big-city dreamer and they fall in love to the greatest metal songs of the 80's. The soundtrack captures not only the songs you know and love from that era, as performed by the cast of Rock of Ages, but it also includes dialogue between the characters as well as a songbook for you to follow along with them. I personally loved the album and now am dying to see the Broadway show (I really, really hope they start touring!). 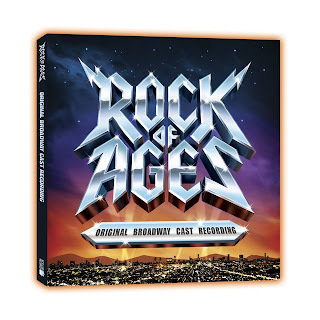 Click here to purchase your copy of the Rock of Ages soundtrack, and click here for more information on this fantastic musical. Rock on! Note: Many thanks to the One2One Network for the privilege of reviewing Rock of Ages!